Lots of “springy things” going on here. 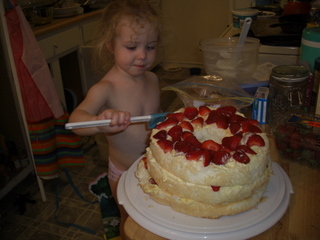 We made a lovely cake (Angel Lush) last night. 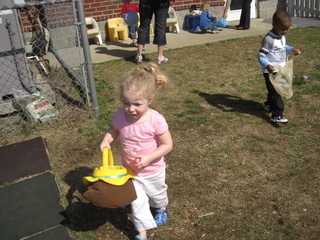 Bug hunted for Easter eggs at school. 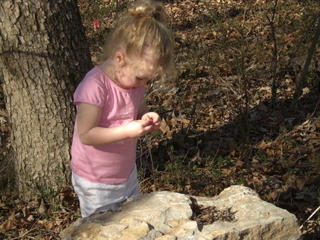 We went to the park and then took a short “walk in the woods”. 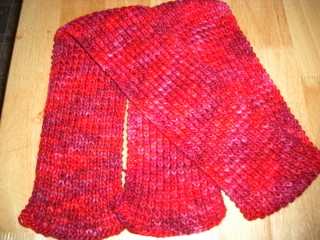 And here is my one-row scarf (an entire skein of Malabrigo, color amoroso on size US 8). I’ve been trying some experimenting with crocheting laceweight (Shimmer from Knitpicks in Stained glass), but nothing seems to look right. I bought it thinking it would be good for a lace scarf, but I’m afraid the colors will obscure the lace pattern. I checked on ravelry and most people do Clapotis with it – I don’t really like the stringy look of the series of dropped stitch threads on that pattern. I did find a couple of possibilities , that is, they are more simple stitches that will allow the yarn to stand out: One person did a montego bay scarf (not nearly so stringy dropped stitches) and one did a knotted scarf. And I finished grading tests – Wahoo! Well, all the signs of spring are here – flowering bushes, daffodils in yards and vases everywhere, warm weather, the need to clean, and … the inability to concentrate because of the nice weather (by students and me, too). It is nice to be outside again, even though there was spitty cold rain this afternoon. In crafty news, I started and finished a “one row scarf” in Malabrigo (amoroso). It looks nothing like the Yarn Harlot’s, but is pretty. Pictures will follow when I can take them in “real light.” I needed something simple, but pretty. Bug was sick last week with a virus (cranky, constipated, and 103 fever), so she came home from daycare on Tuesday and didn’t return until Friday. I got sick with something else on Friday and am just now recovering – a cough lingers for me, but Bug is all well. DH managed to resist both (as of yet). 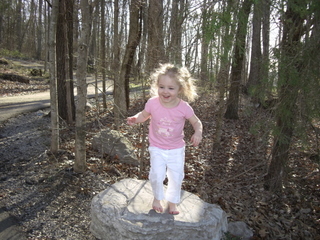 DH took Bug to visit Nana and Pappaw T this weekend (Sat morn to Sunday evening), so I had a whole day + to myself. I didn’t really know what to do without them here. I did dance with the group (Gypsy Sistars) at the Stella Luna hafla in Lebanon, TN on Saturday evening. It was fun, but I was coughing a bunch from my cold. The daffodils are blooming and some of the flowering cherries are, too! There is daylight to play in after we get home from work/school and grill in for dinner! I trimmed the blackberry thicket while the pork chops were on the grill. I also came home from spring break to find a wonderful surprise from my pal from SP11 (Barbara of Coffee Yarn). She sent me some “bare” yarn and some brown dye even though SP11 is long over. I had mentioned that I wanted to dye some brown and actually had found her blog when I was looking for “dyeing with coffee” instructions. She is such a thoughtful person! 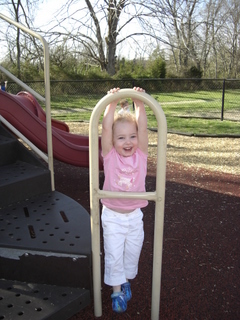 The last week has been full of adventure… we visited Nana and Pappaw S in Ohio. 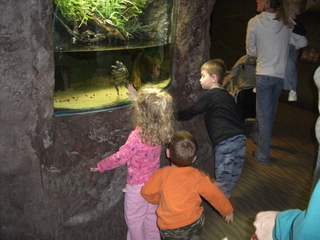 We went to the aquarium in Newport, KY (near Cincinnati) and came home to snow here in TN. 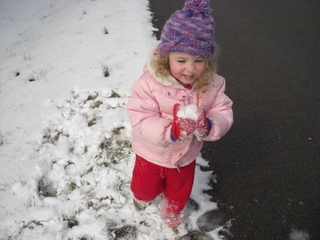 Bug threw snowballs at me for an hour on Saturday morning – the snow was nearly gone by Saturday afternoon. I finished the second pair of alpaca fetching fingerless gloves and gave them to my mom – sorry, no picture of the finished item. They turned out nice. I made them a bit longer by adding an extra cable repeat and a longer thumb.